A working meeting between Alexey Miller, Chairman of the Gazprom Management Committee, and Sylvie Bermann, Ambassador Extraordinary and Plenipotentiary of France to the Russian Federation, took place today at the Arctic: Territory of Dialogue 5th International Arctic Forum in St. Petersburg. The parties discussed issues related to cooperation in the gas sector, including gas supplies. It was noted that France ranks among Gazprom's key markets in Europe. The Company's gas exports to the country grew by 58 per cent in five years, reaching 12.9 billion cubic meters in 2018. Particular attention at the meeting was paid to the progress of the Nord Stream 2 project. 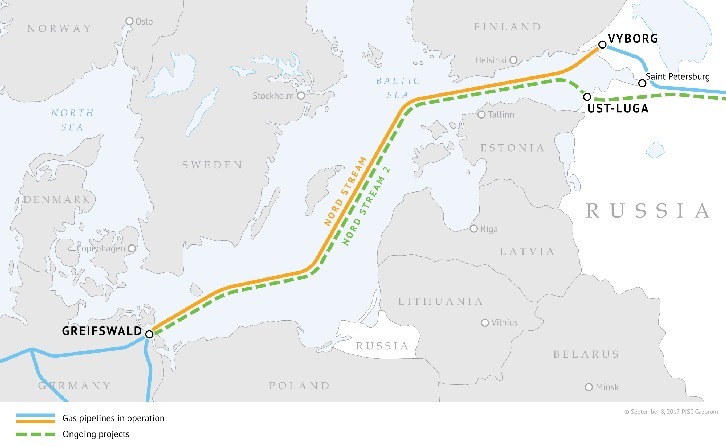 It was highlighted that 978 kilometers of pipes – 40 per cent of the gas pipeline's total length – have been laid in the Baltic Sea by now. Nord Stream and Nord Stream 2 gas pipelines. Image by Gazprom. In 2018, Gazprom supplied to France 12.9 billion cubic meters of gas, an increase of 5.4 per cent against 2017 (12.3 billion cubic meters). Nord Stream 2 is the construction project for a gas pipeline with the annual capacity of 55 billion cubic meters from Russia to Germany across the Baltic Sea.